Beyond Chess was created in 2001 by David L. Crockett. Dave Crockett, was a United States Marine when he designed the concept of a moving board. Traditional chess is fashioned after the ancient style of warfare where two armies march toward each other across an open field of battle. As a Marine, Dave Crockett knew very well that modern warfare is fought over vast expanses and the environment is ever changing from moment to moment. The dynamic of a moving board creates an ever changing environment that directly affects the movement of the chessmen and the strategy of the game all the way to checkmate. Because the board is made of individual squares, they can be setup in any configuration to begin the game. This means the board can be used universally to mimic just about any other chess variation (like the 5x6, 8x10, 9x9 boards, etc.) and with variations such as Bughouse and Plunder Chess, only with the added benefit of being able to move the board squares as part of the game play. you could even setup the board differently every time you play, making the possibilities endless. Dave Crockett took Beyond Chess with him in 2003 to Iraq and played the game with fellow Marines during down time. The rules of Beyond Chess have a copyright 2006, Beyond Chess is trademarked 2007 and the moving board has a patent pending. The board starts out as a standard 8x8 grid, however, as the game progresses, the squares of the board can be shifted, creating a larger grid with gaps. Alternate starting grids may be used, creating unique board shapes. Beyond Chess uses the standard chess pieces. On a player's turn, a single piece is moved, followed by the shifting of a square. The square that is shifted may only be shifted one square orthogonally. The square that is shifted must be empty, except if a "gereting" move is made. A "gereting" move, involves shifting a square that contains a friendly pawn. This move counts as both a piece move, and a square shift, so it is the only action for a single turn. I assume there are other rules governing the shifting of squares, relating to isolating squares, and to preventing the board grid from becoming too sparse. 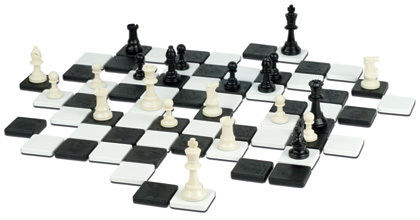 Beyond Chess is a commercially available game. The name is trademarked and the rules are copyrighted. For details on purchasing this game, as well as more information (including a strategy guide), go to the Beyond Chess web site. Looking at the game board, I think it would be nice if the tiles were white on one side, black on the other. Then, when shifting a tile, it could also be flipped, to maintain a classic checkered (ie. alternating black and white tiles) board look. Note that this game would also make a nice addition to any one's "chess variant kit", expanding on the possibilities of different boards and different dynamics for chess, as well as other chess variants. Author: David Howe. Inventor: David Crockett. I found it plays well for the most part. The tiles are also a way to create board layouts. It' a good concept, it augments the entertainment value, but for me setting up the pieces at the beginning is enough... let alone all the squares too! Not for me, but neat. I look forward to trying it again sometime. I had a good time also with it. I believe the game can also act as a Mutator of a sort for a lot of square space chess variants. IAGO Chess would also map to it well, for example. I had the chance to play this game at NonCon [Vassar College - Feb 22-24] a few weeks ago; it's a very interesting and challenging game. I have to admit I didn't play the game totally seriously; I couldn't resist playing B-N5, then moving my opponent's R3 square sideways, so he couldn't chase my bishop with his pawn - sort of a childhood fantasy come true. While plays like that did cost me the game, this little bit of description gives you a slight idea of what goes on in this game. One thing I noted was that the plastic board squares were thick and dense enough to work as advertised - they were easy to manipulate, and tended to stay in place, rather than start wandering around from nudgings during movement, as I'd originally feared. It's a nice idea, decently presented.